As if deliberately trying to embarrass Deborah Arnott and her laughable slippery slope denial, Professor of Politics and Public Policy at the University of Stirling Paul Cairney has written on the LSE website what is effectively a guide to how anti-alcohol miseries can achieve the same as the tobacco control industry in coming decades. He begins by explaining how prohibitionists 'select' evidence. Or 'lie', as it is known to the rest of us (emphases mine). Evidence based policymaking (EBPM) is about power: to decide what counts as evidence; to ignore or pay attention to particular studies; to link the evidence of a policy problem to a particular solution; and, to ensure that policymakers have the motive and opportunity to turn a solution into policy. Indeed, an attempt to portray EBPM as a technical or scientific process is often an attempt to exercise power: to rule some evidence in and most evidence out; and, to use particular forms of evidence to justify political action. Yep, that's about the sum of it. It should, of course, more accurately be called PBEM - policy based evidence-making. After describing how tobacco was in the same popular position 30 years ago as alcohol is now, he makes observations on how alcohol can follow the same denormalisation route in the future. The tobacco experience suggests that changes in these factors are mutually reinforcing; major policy change is the result of the complex interplay between all of these processes. For example, an increased acceptance of the unequivocal alcohol-is-harmful scientific evidence would help shift the way that governments ‘frame’ or understand the alcohol policy problem. 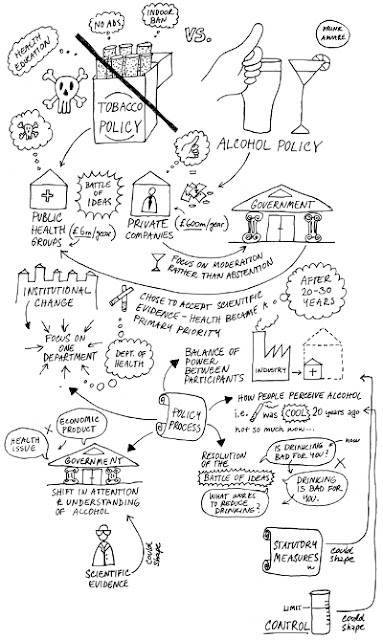 The framing of alcohol as a public health problem would allow the health department to take the policy lead and consult primarily with public health groups. Alcohol control and alcohol use may also go hand in hand: a decrease in drinking rates reduces the barriers to alcohol control; more alcohol control means fewer drinkers (or less drinking). The replacement of voluntary alcohols with statutory measures would reduce the routine involvement of the industry in government. Now, let's once again revisit Deborah's departure from the realms of reality, shall we? University Professors writing on the website of the London School of Economics about exactly how (and when) it will be done is just part of a vast Big Tobacco funded libertarian conspiracy. DP, I cannot tell you how glad I am that I live in a country where all this stupidity doesn't even make the back page. If you tried to expound this claptrap to a Greek, he'd just raise his eyebrows in a condescending manner and order another Tsipouro. "Those foreigners are crazy", he'd say to himself. He's an expert in political policy. 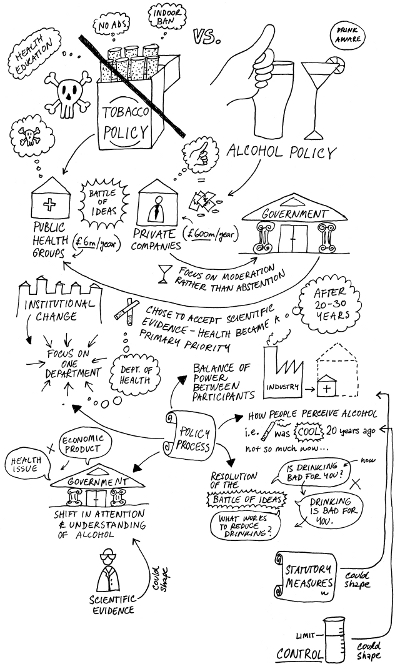 He doesn't say that he's in favour of alcohol control, but merely makes the point that denormalisation of alcohol in the future offers great potential by following tobacco control pathways. Whereas Arnott says he is making a patently false argument. Incredibly, he instead doesn't like *me* on Twitter rather than Arnott who is rubbishing his entire premise. But then, Uni of Stirling has a track record of being comprehensively dictatorial on these matters so I'm not too surprised. >>He's an expert in political policy. Can't we re-locate them to Tripoli or Benghazi? The piece seemed surprisingly fair and even-handed to me. Dammit. Stupid Disqus reformatting. Makes me sound like a modern poet or something.